Let’s start this post the way I ended the one before. Our population is getting older. Labor force participation is down. The average worker is getting poorer. The average adult is getting fatter and sicker. There are fewer intact families, and less family support. Jobs are very temporary, even among those who still have actual jobs. Unions have disappeared except in the public sector, where they have become another part of the ruling class getting richer as the expense of most workers. People are moving around the country, spending their childhood and getting their education in one state, their working and taxpaying years in one or more different states, and their retirement in yet another state. Leaving friends, family, church and community behind – often far behind. More people are dying early, and becoming disabled early. With a cradle to grave welfare system and an otherwise fractured and mobile society, a relationship with the federal government is becoming the only relationship most Americans will have from cradle to grave. All these factors are likely to turn the federal government, more and more, into just an insurance company that also has an army, a government that is less and less able to accomplish much of anything else. Trying to change this long-term trend, given our economic, demographic and social conditions, would likely cause a social collapse with far more suffering and early death than is taking place already. There is lots of bad news about this, but perhaps a little good news as well. That good news has something to do with the views of Supreme Court Chief Justice John Roberts, and President Franklin Delano Roosevelt’s “Four Freedoms” speech. This is the last of a series of posts on historical trends in the federal budget – revenues, expenditures, and debt. As shown in my prior post, a higher and higher share of federal spending goes not to public services, but to payments to or for the benefit of individual people, mostly for seniors but also for the less well off. The so-called “entitlements” that are not enacted each year as part of the federal budget, but rather (like the tax code) just continue on until they are changed. Social Security and Medicare. Medicaid and Obamacare. SSI, SDI and federal extended unemployment insurance. The Earned Income Tax Credit and SNAP (food stamps). With the exception of defense, more than ever before the federal government just takes money in, and pays it out. The rest of the federal government is fading away. To me the worst aspect of federal government policy (and state policy and local policy and other social and economic trends) has been generational inequity. Those born from 1930 to 1957 or so wanted to get more out of the government and put less in, and politicians delivered by selling off the future that is now the present. And the majority of people in these generations, which I have identified as Generation Greed, are absolutely unwilling to give anything back, or to even to hear about how their choices have affected those who followed. The result is silence and deception with regard to the challenges our nation faces. Medicare consumed nearly 15% of the federal budget in 2014. Its trustees project that the Part A trust fund—which pays for hospital costs and is funded through a dedicated payroll tax—will be depleted in 2030 if no changes are made to rein in costs or increase funding. That doesn’t mean bankruptcy, however: The fund will still be able to be pay 86% of Part A costs after then. I will be 69 in 2030. I’ve been watching that bullet fly toward me since the Reagan Administration. Part B pays for doctor’s visits and other outpatient services and is funded through a combination of premiums paid by beneficiaries and general tax revenue. Because of its funding structure, Part B is not projected to become insolvent—but it is expected to devour an increasing share of federal dollars in the coming decades. It’s considered unlikely that the generations to come will enjoy the same level of benefits as today’s Medicare recipients. But if hard decisions are faced and changes are made, experts say, some kind of health care safety net will remain for future retirees and other users of the program. “Hard choices” by our current politicians? “Some kind of safety net?” If all the federal government can afford for “the generations to come” is “some kind of safety net,” even though those generations will almost certainly also pay more in taxes as a share of their income over their lives than the generations benefitting from Medicare today, how can the federal government afford the current level of benefits for today’s beneficiaries? See the difference there? One might see the ongoing shift in federal spending priorities toward more for payments to individuals, and less for everything else, as yet another aspect of generational inequity. After all, “everything else” includes all the federal spending in the present that provides benefits in the future, a future that the majority of those in Generation Greed don’t seem to care about. Spending on research and development, energy, infrastructure, and education, for example. As my compilation showed, federal spending in these categories and other similar categories combined fell from about 2.6% of GDP in 1979, before the start of the current political era, to just 1.4% in FY 2014, with additional decreases almost guaranteed. There is another way of looking at this trend, however, one that takes into account the fact that the government is just one part of our society, and the federal government is just one part of the government. There are state and local governments too. Back in the early 1980s, when I was in college, a common political science description of the trend in U.S. government was this. Once it was “layer cake” government, with each level of government – federal, state and local — responsible for different government functions. But now it was “marble cake government,” with all levels of government involved in everything, and having to coordinate to get anything done. Isn’t that cool? I didn’t think it was cool. With no one set of politicians responsible for anything in particular, voters had no idea whom to hold accountable for what. And sure enough we had 30 years of Education Presidents, Trade Negotiating Governors, and Foreign Policy Mayors. A host of politicians willing to talk about anything except for the very public services and benefits they in fact were mostly responsible for. And lots of government dysfunction, and selling off of the future in the hopes that in the end some other group of politicians at some other level of government would be stuck making people pay the costs that came along with the benefits. That’s a lot better than what I have heard in the past. When, after the money had been skimmed off the top, the solution for every problem in New York City was the federal money the city wasn’t getting. Housing? Federal money. Transportation? Federal money. Education? Federal money. Policing? Federal money. Nothing we can do, don’t blame us. I was once assigned as a Department of City Planning staff member to help the City Planning Commission write a Planning and Zoning Report. After listening to this for a while I couldn’t take it anymore, and asked “is New York City getting a fair share of federal spending relative to the money it pays in?” And everyone answered No! Then why, I asked, why did the members of the Commission believe that having the federal government take more money out of New York would result in a better deal with regard to money being paid back in? It is the extra money the federal money is not currently spending that would come to New York, they answered. To the extent that different states and areas have different characteristics and needs, in fact, I’ll bet that virtually every jurisdiction believes the federal government is ripping it off, true or not. We can’t go back to a pre-New Deal government, in which states and localities are responsible for aid to the poor, the unemployed and seniors, and for health care. That is because people can move between states, with resources moving in one direction and needs in another. Any state or locality that met those needs would get stuck with all the old, poor, sick and unemployed, and be unable to meet their needs. Even today, it isn’t fair when someone who paid taxes their entire work life in New York spends their final years in a nursing home in Florida, half financed by Florida taxpayers under Medicaid. Or when an older person who paid lots of taxes as a relatively young, affluent retiree in Florida, because they didn’t want to pay higher New York taxes, comes back to New York for Medicaid-financed custodial care when their money and health is gone. It isn’t fair when someone from Georgia who is ill shows up in New York, gets a cup of coffee while getting declared a resident, and then has an expensive Medicaid-funded surgery, half paid for by the City and State of New York, before returning to Georgia when well. It isn’t fair when the mentally ill and addicted are told to go to a more generous state for treatment. There was an attempt, under the Welfare Reform act of 1996, to limit this sort of tax and public benefit arbitrage, by allowing states to limit the migrating needy to whatever benefits they would have received in their state of origin. But the U.S. Supreme Court overturned that provision, and voided the possibility of any state providing social insurance for its own residents paid for by those residents, in the Saenz v. Roe. Decision. An incredibly important decision that has rarely been spoken of since the day it was rendered. Since those on the right don’t want to admit that the low-tax Red States get their low taxes in part from shirking their social responsibilities. And those on the left don’t want to admit that generous social programs simply attract more beneficiaries, and the higher taxes required to fund those programs sends the tax base elsewhere. In the wake of Saenz v. Roe, and given that both those in need and those with resources are mobile, providing money direct to people is exactly what the federal government needs to do, because it is beyond to capacity of state and local government. In my view, the federal government should go even further in this direction, taking full financial responsibility and operational control of all income, food and health security functions. Why should New Yorkers be at risk of Ebola or Zika because residents of states such as Texas don’t want to pay up for the basic public health benefits required to prevent epidemics? Why involve the states at all? Something else moves between the states: information. States will never invest enough in research and development, because the fruits of that spending may create economic development somewhere else. I’ve argued that somewhere there ought to be many different versions of a complete pre-K to 12 education up on the internet, with video game quality, to ensure that parents and kids with internet access at least have a chance no matter how bad the local schools are. Since something like that ought to be available to anyone in the country, that is something else that should be funded – if not organized – by the national government. Were it up to me, the federal government would do for information what it did for Homeland Security. Combine a bunch of orphaned functions into one focused agency: the Department of Science, Statistics and Public Information. Including the BLS, BEA, Census Bureau, USGS, NOAA, NASA, NIH, CPB, etc. etc. On the other hand, what doesn’t move between states? The built environment for one thing. Housing, transportation, and other infrastructure. Business and economic development subsidies for another. Different states have different needs and different preferences, so the right approach is you pay for yours, we’ll pay for ours, and we’ll cut out the middleman in Washington. 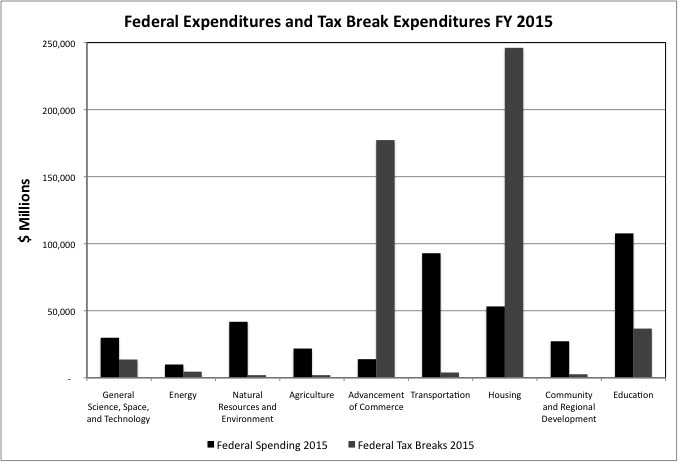 With actual federal spending more and more constricted in these categories, more and more federal action is in the form of tax breaks. And because tax breaks are more opaque than voted on federal expenditures, they are used to do things that politicians would never date to vote for directly. Redistribute in come up, for example, because most tax breaks are worth more the more you earn (and thus the higher your marginal tax bracket) and the more you spend. For example, the cost of housing tax breaks such as the mortgage interest deduction, which encourages well off people (those well off enough to itemize deductions) to spend more on bigger houses, is nearly five times the cost of actual federal spending on housing assistance to the needy. Then there are the federal government’s contingent liabilities, the value of which isn’t even being counted. Federal backing for FHA mortgages, Fannie Mae and Freddie Mac, for example. Flood insurance. The Pension Benefit Guarantee Corp. The federal government has made so many promises to pay for so much that if things go badly there will be no money for anything else. People credit the federal government with saving the environment, allowing the frontier to be settled, knitting the country together, winning World War II and requiring the former slave states to provide Afro-Americans with equal rights. There is some truth to that. In some cases, moreover, the federal government should have declared victory and gone home. And in other cases federal action has not always been to the good. With its housing and infrastructure policies, the federal government shifted resources out of the older cities that had been built by the private sector, and into sprawling low-density suburbs. Putting most of the U.S. population in places where it is expensive to live. For decades federal money, tax breaks, and contingent liabilities (guarantees) went exclusively to new housing and infrastructure, while existing housing and infrastructure was allowed to deteriorate. Starting with 1938 FHA lending standards that blackballed Afro-Americans and redlined mixed-income and race communities, the federal government insured that these new places would be segregated for the first 50 years of their existence. Federal flood insurance, meanwhile, has led to large-scale development in flood plains. As for business subsidies, those for agricultural staples and dairy, but not fruits and vegetables, have influenced the American diet, which now consists largely of high fructose corn syrup and industrial cheese. The American people are told they are supporting the family farmer, but most of the money goes to industrial agribusiness. Wall Street has to be bailed out because the failure of one of the largest firms could have caused a cascading collapse of the financial system, but the result of the bailout was even fewer, larger firms. The railroads were taxed and regulated into bankruptcy even as the interstate highways were built for trucks. The airline industry was bailed out after 9/11, the auto industry was bailed out in the Great Recession, and the nuclear power industry was subsidized by having the risk of disaster and cost of waste disposal socialized. Or it would be socialized if the federal government ever got its act together on disposal. For much of the past 35 years, the policy of the Republican Party with regard to the federal budget has been “stave the beast.” That is, intentionally drive the federal government closer to bankruptcy by handing out tax breaks without spending cuts, forcing people to accept less in services later, and as more and more money is diverted to interested on the national debt. Generation Greed of course loved the short-term benefits, and was easily fooled with regard to the long-term costs. The goal was to drown the federal government in a bathtub, perhaps conveniently killing off the old, poor and sick people who depend on it at the same time. There is, however, more than one way to “starve the beast.” Rising entitlement spending, payments direct to individuals, also takes resources away from other spending priorities. Limiting the scope, if not the size, of the federal government. This is generally described as a bad thing, but I’m not sure I agree. You see that Congress? You see those candidates for President? How much decision making power do you want those people to have in your life? If there is less “discretionary spending,” those people have less discretion. If current trend continue, perhaps the Congress could meet just a few weeks a year and otherwise leave us alone. One might say that this is a bad time for the Northeast to have the federal government shrink. After all, many of the states with the most sold out futures are in our part of the country, as I showed here. Moreover, we have a state legislature where 33 members and three leaders have been found guilt of corruption in recent years, and that is just the ones they catch. So won’t New York City need even more federal money just to keep its built environment afloat? Not if our state and local leaders grow up. Besides, why should those in Republican-voting states bailout states that were irresponsible with regard to debt, pensions and infrastructure? On the other hand, it turns out those Republican-voting states have some irresponsibilities of their own, and many of them are facing fiscal crises too. In category after category, my compilation of state and local government expenditures per $1,000 of personal income shows, it is the so-called Red States that spend the most. But they have lower taxes. Thanks to federal money. Why should those in higher-tax states pay federal taxes so those in lower tax states can have things the lower tax states aren’t willing to pay for themselves? Pay to help the individual people there? Sure. We’re all Americans. Invest public money in those places? Not if those at the top in those low-tax states aren’t willing to pay state taxes themselves. I saw Senator Schumer bragging on television (Channel 25 I think it was) that the Democrats were able to force the Republicans to give up the sequester, which had deeply cut defense and what is left of “discretionary” domestic spending equally, in the latest federal budget. He’s happy, but I loved the sequester. Because that sequester, and the differential economic growth in so-called Red and Blue States since the Great Recession, exposed who actually gets the lion’s share of the benefit of federal spending. Those in the states where the politicians complain about “big government.” Really? The Republicans gave up the sequester, in reality, because that lesson was beginning to sink in. I would have let it sink in some years longer. Does anybody agree with me, with regard to limiting the scope of the federal government? Perhaps Supreme Court Chief Justice Roberts. When he broke the tie and wrote the decision in National Federation Of Independent Business Et Al. v. Sebelius, Secretary of Health and Human Services, Et Al., the press described it as a political compromise with no coherent philosophy behind it. That decision allowed the federal government to impose the health insurance mandate under the Affordable Care Act, aka Obamacare, but also held that states did not have to expand Medicaid in the way the act prescribed. At the time I accepted the view of the press and pundits, but later I decided to read the decision myself. He certain seems to have an idea of what he wants to see happen. The Federal Government “is acknowledged by all to be one of enumerated powers.” Ibid. That is, rather than granting general authority to perform all the conceivable functions of government, the Constitution lists, or enumerates, the Federal Government’s powers. The general government power, known as the “police power,” resides with the states. And the Chief Justice likes it that way. “State sovereignty is not just an end in itself: Rather, federalism secures to citizens the liberties that derive from the diffusion of sovereign power.” New York v. United States, 505 U.S. 144, 181 (1992). Because the police power is controlled by 50 different States instead of one national sovereign, the facets of governing that touch on citizens’ daily lives are normally administered by smaller governments closer to the governed. The Framers thus ensured that powers which “in the ordinary course of affairs, concern the lives, liberties, and properties of the people” were held by governments more local and more accountable than a distant federal bureaucracy. The opinion goes to great lengths to not uphold the Obamacare individual mandate as part of the federal government’s enumerated power to regulate interstate commerce. Even though health insurance is in fact interstate commerce. But instead it notes that the mandate is like a tax. The reason the federal government has a mandate for health insurance instead of a federal tax and federal spending on health insurance is that the Obama Administration, and Republican think tanks that were in favor of the private health insurance mandate before Obama proposed it, wanted to pretend they were not raising taxes. The Obama Administration then ended up arguing before the Supreme Court a mandate is in fact a tax. They were right the second time. A mandate is a tax – an inefficient, inequitable tax. Congress may also “lay and collect Taxes, Duties, Imposts and Excises, to pay the Debts and provide for the common Defence and general Welfare of the United States.” U. S. Const., Art. I, §8, cl. 1. Put simply, Congress may tax and spend. And it can also use that power to force states and localities to tax, spend and follow rules, though it appears the Chief Justice doesn’t really like the idea. In exercising its spending power, Congress may offer funds to the States, and may condition those offers on compliance with specified conditions. See, e.g., College Savings Bank v. Florida Prepaid Postsecondary Ed. Expense Bd., 527 U. S. 666, 686 (1999). These offers may well induce the States to adopt policies that the Federal Government itself could not impose. See, e.g., South Dakota v. Dole, 483 U. S. 203, 205–206 (1987) (conditioning federal highway funds on States raising their drinking age to 21). Under the decision, Roberts held that the federal government could decide to not increase Medicaid funding for states that did not expand Medicaid. That is like a contract – take our money, accept our rules. But it could not take away existing Medicaid money from the states that did not expand Medicaid. That is more like telling the states what to do. This case concerns two powers that the Constitution does grant the Federal Government, but which must be read carefully to avoid creating a general federal authority akin to the police power. Past federal interference in the regulation of individual conduct, generally a state role, includes the overthrow of racial segregation by state law. Enforcing equal constitutional rights under the 14th amendment to the Constitution was clearly Constitutional and the right thing to do. But other federal interventions have also included Prohibition and the War on Drugs, one effort that failed and one that is failing. The federal government halted a state by state debate on abortion by suddenly legalizing it nationwide, setting the stage for a bitter national divide instead of state by state differences. Thus far it is allowing that debate to continue with regard to assisted suicide. The federal government acted first to prevent states from legalizing gay marriage, and then to force them to legalize gay marriage. With regard to drinking and driving, a state or located that wanted to encourage transit use and active transportation (bicycling and walking) to improve health might have chosen to increase the driving age to 21, instead of the drinking age. The federal government decided to force all states and localities to increase the drinking age instead. A one size fits all solution that has led to even more binge drinking on college campuses. People tend to be happy when the federal government comes down on their side, and angry when it comes down on someone else’s side. Perhaps, however, unless things are very, very clear, it would be better if the federal government allowed different states and areas to do things different ways. What does the federal government need to do? Perhaps it should focus on ensuring the “Four Freedoms” for every American, and encouraging the rest of the world to achieve the same. And leave the rest to state and local government. Linked below is a new copy of the spreadsheet I created on federal expenditures and revenues, with the charts produced after I included it in the first post in this series.